"Titanic" redirects here. For the film by James Cameron, see Titanic (1997 film). For other uses, see Titanic (disambiguation). Identification: Radio call sign "MGY"
RMS Titanic (/taɪˈtænɪk/) was a British passenger liner that sank in the North Atlantic Ocean in the early morning of 15 April 1912, after colliding with an iceberg during her maiden voyage from Southampton to New York City. Of the 2,224 passengers and crew aboard, more than 1,500 died, making it one of the deadliest commercial peacetime maritime disasters in modern history. 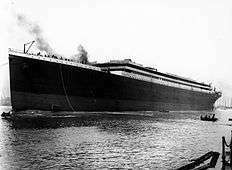 The largest ship afloat at the time it entered service, the RMS Titanic was the second of three Olympic class ocean liners operated by the White Star Line, and was built by the Harland and Wolff shipyard in Belfast. Thomas Andrews, her architect, died in the disaster. Under the command of Edward Smith, who went down with the ship, Titanic carried some of the wealthiest people in the world, as well as hundreds of emigrants from Great Britain and Ireland, Scandinavia and elsewhere throughout Europe seeking a new life in North America. A high-power radiotelegraph transmitter was available for sending passenger "marconigrams" and for the ship's operational use. Although Titanic had advanced safety features such as watertight compartments and remotely activated watertight doors, there were not enough lifeboats to accommodate all of those aboard due to outdated maritime safety regulations. Titanic only carried enough lifeboats for 1,178 people—slightly more than half of the number on board, and one third of her total capacity. 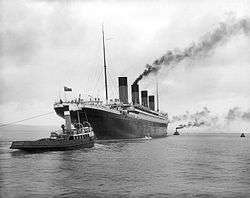 After leaving Southampton on 10 April 1912, Titanic called at Cherbourg in France and Queenstown (now Cobh) in Ireland before heading west to New York. On 14 April, four days into the crossing and about 375 miles (600 km) south of Newfoundland, she hit an iceberg at 11:40 p.m. ship's time. The collision caused the ship's hull plates to buckle inwards along her starboard side and opened five of her sixteen watertight compartments to the sea; the ship gradually filled with water. Meanwhile, passengers and some crew members were evacuated in lifeboats, many of which were launched only partially loaded. A disproportionate number of men were left aboard because of a "women and children first" protocol for loading lifeboats. At 2:20 a.m., she broke apart and foundered—with well over one thousand people still aboard. Just under two hours after Titanic sank, the Cunard liner RMS Carpathia arrived at the scene, where she brought aboard an estimated 705 survivors. The disaster was greeted with worldwide shock and outrage at the huge loss of life and the regulatory and operational failures that had led to it. Public inquiries in Britain and the United States led to major improvements in maritime safety. One of their most important legacies was the establishment in 1914 of the International Convention for the Safety of Life at Sea (SOLAS), which still governs maritime safety today. Additionally, several new wireless regulations were passed around the world in an effort to learn from the many missteps in wireless communications—which could have saved many more passengers. The wreck of Titanic, first discovered over 70 years after the sinking, remains on the seabed, split in two and gradually disintegrating at a depth of 12,415 feet (3,784 m). Since her discovery in 1985, thousands of artefacts have been recovered and put on display at museums around the world. Titanic has become one of the most famous ships in history; her memory is kept alive by numerous works of popular culture, including books, folk songs, films, exhibits, and memorials. The name Titanic was derived from Greek mythology and meant gigantic. Built in Belfast, Ireland, in the United Kingdom of Great Britain and Ireland (as it was then known), the RMS Titanic was the second of the three Olympic-class ocean liners—the first was the RMS Olympic and the third was the HMHS Britannic. They were by far the largest vessels of the British shipping company White Star Line's fleet, which comprised 29 steamers and tenders in 1912. The three ships had their genesis in a discussion in mid-1907 between the White Star Line's chairman, J. Bruce Ismay, and the American financier J. P. Morgan, who controlled the White Star Line's parent corporation, the International Mercantile Marine Co. (IMM). The ships were constructed by the Belfast shipbuilders Harland and Wolff, who had a long-established relationship with the White Star Line dating back to 1867. Harland and Wolff were given a great deal of latitude in designing ships for the White Star Line; the usual approach was for the latter to sketch out a general concept which the former would take away and turn into a ship design. Cost considerations were relatively low on the agenda and Harland and Wolff was authorised to spend what it needed on the ships, plus a five percent profit margin. In the case of the Olympic-class ships, a cost of £3 million for the first two ships was agreed plus "extras to contract" and the usual five percent fee. On 29 July 1908, Harland and Wolff presented the drawings to J. Bruce Ismay and other White Star Line executives. Ismay approved the design and signed three "letters of agreement" two days later authorising the start of construction. At this point the first ship—which was later to become Olympic—had no name, but was referred to simply as "Number 400", as it was Harland and Wolff's four hundredth hull. Titanic was based on a revised version of the same design and was given the number 401. B Deck, the Bridge Deck, was the top weight-bearing deck and the uppermost level of the hull. More First Class passenger accommodation was located here with six palatial staterooms (cabins) featuring their own private promenades. On Titanic, the A La Carte Restaurant and the Café Parisien provided luxury dining facilities to First Class passengers. Both were run by subcontracted chefs and their staff; all were lost in the disaster. The Second Class smoking room and entrance hall were both located on this deck. The raised forecastle of the ship was forward of the Bridge Deck, accommodating Number 1 hatch (the main hatch through to the cargo holds), numerous pieces of machinery and the anchor housings. [lower-alpha 2] Aft of the Bridge Deck was the raised Poop Deck, 106 feet (32 m) long, used as a promenade by Third Class passengers. It was where many of Titanic's passengers and crew made their last stand as the ship sank. The forecastle and Poop Deck were separated from the Bridge Deck by well decks. F Deck, the Middle Deck, was the last complete deck and mainly accommodated Second and Third Class passengers and several departments of the crew. The Third Class dining saloon was located here, as were the swimming pool and Turkish bath. G Deck, the Lower Deck, was the lowest complete deck that carried passengers, and had the lowest portholes, just above the waterline. The squash court was located here along with the travelling post office where letters and parcels were sorted ready for delivery when the ship docked. Food was also stored here. The deck was interrupted at several points by orlop (partial) decks over the boiler, engine and turbine rooms. Titanic was equipped with three main engines—two reciprocating four-cylinder, triple-expansion steam engines and one centrally placed low-pressure Parsons turbine—each driving a propeller. The two reciprocating engines had a combined output of 30,000 hp and a further 16,000 hp was contributed by the turbine. The White Star Line had used the same combination of engines on an earlier liner, the SS Laurentic, where it had been a great success. It provided a good combination of performance and speed; reciprocating engines by themselves were not powerful enough to propel an Olympic-class liner at the desired speeds, while turbines were sufficiently powerful but caused uncomfortable vibrations, a problem that affected the all-turbine Cunard liners Lusitania and Mauretania. By combining reciprocating engines with a turbine, fuel usage could be reduced and motive power increased, while using the same amount of steam. They were heated by burning coal, 6,611 tons of which could be carried in Titanic's bunkers with a further 1,092 tons in Hold 3. The furnaces required over 600 tons of coal a day to be shovelled into them by hand, requiring the services of 176 firemen working around the clock. 100 tons of ash a day had to be disposed of by ejecting it into the sea. The work was relentless, dirty and dangerous, and although firemen were paid relatively generously there was a high suicide rate among those who worked in that capacity. Exhaust steam leaving the reciprocating engines was fed into the turbine, which was situated aft. From there it passed into a condenser, to increase the efficiency of the turbine and so that the steam could be condensed back into water and reused. The engines were attached directly to long shafts which drove the propellers. There were three, one for each engine; the outer (or wing) propellers were the largest, each carrying three blades of manganese-bronze alloy with a total diameter of 23.5 feet (7.2 m). The middle propeller was slightly smaller at 17 feet (5.2 m) in diameter, and could be stopped but not reversed. Titanic's electrical plant was capable of producing more power than an average city power station of the time. Immediately aft of the turbine engine were four 400 kW steam-driven electric generators, used to provide electrical power to the ship, plus two 30 kW auxiliary generators for emergency use. Their location in the stern of the ship meant that they remained operational until the last few minutes before the ship sank. Titanic's rudder was large enough—at 78 feet 8 inches (23.98 m) high and 15 feet 3 inches (4.65 m) long, weighing over 100 tons—that it required steering engines to move it. Two steam-powered steering engines were installed though only one was used at any one time, with the other one kept in reserve. They were connected to the short tiller through stiff springs, to isolate the steering engines from any shocks in heavy seas or during fast changes of direction. As a last resort, the tiller could be moved by ropes connected to two steam capstans. The capstans were also used to raise and lower the ship's five anchors (one port, one starboard, one in the centreline and two kedging anchors). The radio room was located on the Boat Deck, in the officers' quarters. A soundproofed "Silent Room", next to the operating room, housed loud equipment, including the transmitter and a motor-generator used for producing alternating currents. The operators' living quarters were adjacent to the working office. The ship was equipped with a 'state of the art' 5 kilowatt rotary spark-gap transmitter, operating under the radio callsign MGY, and communication was conducted in Morse code. This transmitter was one of the first Marconi installations to use a rotary spark gap, which gave Titanic a distinctive musical tone that could be readily distinguished from other signals. The transmitter was one of the most powerful in the world, and guaranteed to broadcast over a radius of 350 miles (563 km). An elevated T-antenna that spanned the length of the ship was used for transmitting and receiving. The normal operating frequency was 500 kHz (600 m wavelength), however the equipment could also operate on the "short" wavelength of 1000 kHz (300 m wavelength) that was employed by smaller vessels with shorter antennas. Titanic was laid out in a much lighter style similar to that of contemporary high-class hotels—the Ritz Hotel was a reference point—with First Class cabins finished in the Empire style. A variety of other decorative styles, ranging from the Renaissance to Victorian, were used to decorate cabins and public rooms in First and Second Class areas of the ship. The aim was to convey an impression that the passengers were in a floating hotel rather than a ship; as one passenger recalled, on entering the ship's interior a passenger would "at once lose the feeling that we are on board ship, and seem instead to be entering the hall of some great house on shore". Passengers could use an on-board telephone system, a lending library and a large barber shop. The First Class section had a swimming pool, a gymnasium, a squash court, a Turkish bath, an electric bath and a Verandah Cafe. First Class common rooms were adorned with ornate wood panelling, expensive furniture and other decorations, while the Third Class general room had pine panelling and sturdy teak furniture. The Café Parisien was located on a sunlit veranda fitted with trellis decorations and offered the best French haute cuisine for First Class passengers. Third Class (also commonly referred to as Steerage) accommodations aboard Titanic were not as luxurious as First Class, but even so were better than on many other ships of the time. They reflected the improved standards which the White Star Line had adopted for trans-Atlantic immigrant and lower-class travel. On most other North Atlantic passenger ships at the time, Third Class accommodations consisted of little more than open dormitories in the forward end of the vessels, in which hundreds of people were confined, often without adequate food or toilet facilities. Third Class accommodations also included their own dining rooms, as well as public gathering areas including adequate open deck space, which aboard Titanic included the Forecastle Deck forward, the Poop Deck aft, both well decks and a large open space on D Deck which could be used as a social hall. This was supplemented by the addition of a smoking room for men and a reading room for women, and although they were not as glamorous in design as spaces seen in upper class accommodations, they were still far above average for the period. One of Titanic's most distinctive features was her First Class staircase, known as the Grand Staircase or Grand Stairway. This descended through seven decks of the ship, from the Boat Deck to E deck in the elegant style depicted in photographs and movies, and then as a more functional and less elegant staircase from there down to F deck. It was capped with a dome of wrought iron and glass that admitted natural light. Each landing off the staircase gave access to ornate entrance halls lit by gold-plated light fixtures. At the uppermost landing was a large carved wooden panel containing a clock, with figures of "Honour and Glory Crowning Time" flanking the clock face. 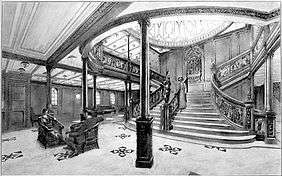 The Grand Staircase was destroyed in Titanic's sinking and is now just a void in the ship which modern explorers have used to access the lower decks. During the filming of James Cameron's Titanic in 1997, his replica of the Grand Staircase was ripped from its foundations by the force of the inrushing water on the set. It has been suggested that during the real event, the entire Grand Staircase was ejected upwards through the dome. Although Titanic was primarily a passenger liner, she also carried a substantial amount of cargo. Her designation as a Royal Mail Ship (RMS) indicated that she carried mail under contract with the Royal Mail (and also for the United States Post Office Department). For the storage of letters, parcels and specie (bullion, coins and other valuables) 26,800 cubic feet (760 m3) of space in her holds was allocated. The Sea Post Office on G Deck was manned by five postal clerks; three Americans and two Britons, who worked 13 hours a day, seven days a week sorting up to 60,000 items daily. The ship's passengers brought with them a huge amount of baggage; another 19,455 cubic feet (550.9 m3) was taken up by first- and second-class baggage. In addition, there was a considerable quantity of regular cargo, ranging from furniture to foodstuffs and even motor cars. Despite later myths, the cargo on Titanic's maiden voyage was fairly mundane; there was no gold, exotic minerals or diamonds, and one of the more famous items lost in the shipwreck, a jewelled copy of the Rubaiyat of Omar Khayyam, was valued at only £405 (£36,162 today). According to the claims for compensation filed with Commissioner Gilchrist, following the conclusion of the Senate Inquiry, the single most highly valued item of luggage or cargo was a large neoclassical oil painting entitled La Circassienne au Bain by French artist Merry-Joseph Blondel. The painting’s owner, first class passenger Mauritz Håkan Björnström-Steffansson, filed a claim for $100,000 ($2.4 million equivalent in 2014) in compensation for the loss of the artwork. Titanic carried a total of 20 lifeboats: 14 standard wooden Harland and Wolff lifeboats with a capacity of 65 people each and four Englehardt "collapsible" (wooden bottom, collapsible canvas sides) lifeboats (identified as A to D) with a capacity of 47 people each. In addition, she had two emergency cutters with a capacity of 40 people each. [lower-alpha 5] Olympic herself did not even carry the four collapsibles A–D during the 1911–12 season. All of the lifeboats were stowed securely on the boat deck and, except for collapsible lifeboats A and B, connected to davits by ropes. Those on the starboard side were odd-numbered 1–15 from bow to stern, while those on the port side were even-numbered 2–16 from bow to stern. Although Titanic was virtually identical to the class's lead ship Olympic, a few changes were made to distinguish both ships. The most noticeable of these was that Titanic (and the third vessel in class Britannic) had a steel screen with sliding windows installed along the forward half of the A Deck promenade. This was installed as a last minute change at the personal request of Bruce Ismay, and was intended to provide additional shelter to first class passengers. These changes made Titanic slightly heavier than her sister, and thus she could claim to be the largest ship afloat. The work took longer than expected due to design changes requested by Ismay and a temporary pause in work occasioned by the need to repair Olympic, which had been in a collision in September 1911. Had Titanic been finished earlier, she might well have missed her collision with an iceberg. On returning to Belfast at about 7 p.m., the surveyor signed an "Agreement and Account of Voyages and Crew", valid for 12 months, which declared the ship seaworthy. An hour later, Titanic left Belfast again—as it turned out, for the last time—to head to Southampton, a voyage of about 570 nautical miles (660 mi; 1,060 km). After a journey lasting about 28 hours she arrived about midnight on 4 April and was towed to the port's Berth 44, ready for the arrival of her passengers and the remainder of her crew. 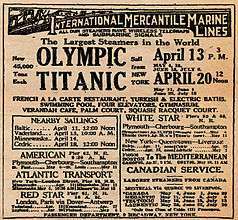 Both Olympic and Titanic registered Liverpool as their home port. The offices of the White Star Line as well as Cunard were in Liverpool, and up until the introduction of the Olympic, most British ocean liners for both Cunard and White Star, such as Lusitania and Mauretania, sailed out of Liverpool followed by a port of call in Queenstown, Ireland. Since the company's founding in 1871, a vast majority of their operations had taken place out of Liverpool. However, in 1907 White Star established another service out of the port of Southampton on England's south coast, which became known as White Star's "Express Service". Southampton had many advantages over Liverpool, the first being its closer proximity to London. White Star's initial plans for Olympic and Titanic on the Southampton run followed the same routine as their predecessors had done before them. Each would sail once every three weeks from Southampton and New York usually leaving at noon each Wednesday from Southampton and each Saturday from New York, thus enabling the White Star Line to offer weekly sailings in each direction. Special trains were scheduled from London and Paris to convey passengers to Southampton and Cherbourg respectively. The deep-water dock at Southampton, then known as the "White Star Dock", had been specially constructed to accommodate the new Olympic-class liners, and had opened in 1911. Most of the crew signed on in Southampton on 6 April; in all, 699 of the crew came from there, and 40% were natives of the town. A few specialist staff were self-employed or were subcontractors. These included the five postal clerks, who worked for the Royal Mail and the United States Post Office Department, the staff of the First Class A La Carte Restaurant and the Café Parisien, the radio operators (who were employed by Marconi) and the eight musicians, who were employed by an agency and travelled as second-class passengers. Crew pay varied greatly, from Captain Smith's £105 a month (equivalent to £9,375 today) to the £3 10s (£313 today) that stewardesses earned. The lower-paid victualling staff could, however, supplement their wages substantially through tips from passengers. 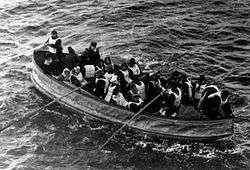 Titanic's passengers numbered approximately 1,317 people: 324 in First Class, 284 in Second Class, and 709 in Third Class. Of these, 869 (66%) were male and 447 (34%) female. There were 107 children aboard, the largest number of which were in Third Class. The ship was considerably under capacity on her maiden voyage, as she could accommodate 2,453 passengers—833 First Class, 614 Second Class, and 1,006 Third Class. Some of the most prominent people of the day booked a passage aboard Titanic, travelling in First Class. 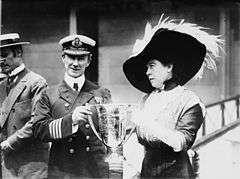 Among them were the American millionaire John Jacob Astor IV and his wife Madeleine Force Astor, industrialist Benjamin Guggenheim, Macy's owner Isidor Straus and his wife Ida, Denver millionairess Margaret "Molly" Brown,[lower-alpha 9] Sir Cosmo Duff Gordon and his wife, couturière Lucy (Lady Duff-Gordon), cricketer and businessman John Borland Thayer with his wife Marian and son Jack, the Countess of Rothes, author and socialite Helen Churchill Candee, journalist and social reformer William Thomas Stead, author Jacques Futrelle with his wife May, and silent film actress Dorothy Gibson, among others. Titanic's owner J. P. Morgan was scheduled to travel on the maiden voyage but cancelled at the last minute. Also aboard the ship were the White Star Line's managing director J. Bruce Ismay and Titanic's designer Thomas Andrews, who was on board to observe any problems and assess the general performance of the new ship. The exact number of people aboard is not known, as not all of those who had booked tickets made it to the ship; about 50 people cancelled for various reasons, and not all of those who boarded stayed aboard for the entire journey. Fares varied depending on class and season. Third Class fares from London, Southampton, or Queenstown cost £7 5s (equivalent to £647 today) while the cheapest First Class fares cost £23 (£2,054 today). The most expensive First Class suites were to have cost up to £870 in high season (£77,682 today). 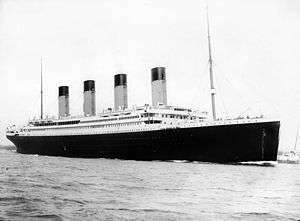 On Wednesday 10 April 1912 Titanic's maiden voyage began. Following the embarkation of the crew the passengers began arriving from 9:30 a.m., when the London and South Western Railway's boat train from London Waterloo station reached Southampton Terminus railway station on the quayside, alongside Titanic's berth. In all, 923 passengers boarded Titanic at Southampton, 179 First Class, 247 Second Class and 494 Third Class. The large number of Third Class passengers meant they were the first to board, with First and Second Class passengers following up to an hour before departure. Stewards showed them to their cabins, and First Class passengers were personally greeted by Captain Smith on boarding. Third Class passengers were inspected for ailments and physical impairments that might lead to their being refused entry to the United States - a prospect the White Star Line wished to avoid, as it would have to carry anyone who failed the examination back across the Atlantic. 922 passengers were recorded as having embarked Titanic at Southampton. Additional passengers were to be picked up at Cherbourg and Queenstown. The maiden voyage began on time, at noon. An accident was narrowly averted only a few minutes later as Titanic passed the moored liners SS City of New York of the American Line and what would have been her running mate on the service from Southampton, White Star's Oceanic. Her huge displacement caused both of the smaller ships to be lifted by a bulge of water and then drop into a trough. New York's mooring cables could not take the sudden strain and snapped, swinging her around stern-first towards Titanic. A nearby tugboat, Vulcan, came to the rescue by taking New York under tow, and Captain Smith ordered Titanic's engines to be put "full astern". The two ships avoided a collision by a matter of about 4 feet (1.2 m). The incident delayed Titanic's departure for about an hour, while the drifting New York was brought under control. After making it safely through the complex tides and channels of Southampton Water and the Solent, Titanic headed out into the English Channel. She headed for the French port of Cherbourg, a journey of 77 nautical miles (89 mi; 143 km). The weather was windy, very fine but cold and overcast. Because Cherbourg lacked docking facilities for a ship the size of Titanic, tenders had to be used to transfer passengers from shore to ship. The White Star Line operated two at Cherbourg, the SS Traffic and the SS Nomadic. Both had been designed specifically as tenders for the Olympic-class liners and were launched shortly after Titanic. (Nomadic is today the only White Star Line ship still afloat.) Four hours after Titanic left Southampton, she arrived at Cherbourg and was met by the tenders. 274 additional passengers were taken aboard, 142 First Class, 30 Second Class, and 102 Third Class. Twenty-Four passengers who had booked passage only cross-channel from Southampton left aboard the tenders to be conveyed to shore. The process was completed within only 90 minutes and at 8 p.m. Titanic weighed anchor and left for Queenstown with the weather continuing cold and windy. At 11:30 a.m. on Thursday 11 April, Titanic arrived at Cork Harbour on the south coast of Ireland. It was a partly cloudy but relatively warm day, with a brisk wind. Again, the dock facilities were not suitable for a ship of Titanic's size, and tenders were used to bring passengers aboard. In all, 123 passengers boarded Titanic at Queenstown, 3 First Class, 7 Second Class and 113 Third Class. In addition to the 24 cross channel passengers who had disembarked at Cherbourg, another seven passengers had booked an overnight passage from Southampton to Queenstown. Among the departures was Father Francis Browne, a Jesuit trainee, who was a keen photographer and took many photographs aboard Titanic, including the last-ever known photograph of the ship. A decidedly unofficial departure was that of a crew member, stoker John Coffey, a Queenstown native who sneaked off the ship by hiding under mail bags being transported to shore. Titanic weighed anchor for the last time at 1:30 p.m. and departed on her westward journey across the Atlantic. Titanic was planned to arrive at New York Pier 54 on the morning of 17 April. After leaving Queenstown Titanic followed the Irish coast as far as Fastnet Rock, a distance of some 55 nautical miles (63 mi; 102 km). From there she travelled 1,620 nautical miles (1,860 mi; 3,000 km) along a Great Circle route across the North Atlantic to reach a spot in the ocean known as "the corner" south-east of Newfoundland, where westbound steamers carried out a change of course. Titanic sailed only a few hours past the corner on a rhumb line leg of 1,023 nautical miles (1,177 mi; 1,895 km) to Nantucket Shoals Light when she made her fatal contact with an iceberg. The final leg of the journey would have been 193 nautical miles (222 mi; 357 km) to Ambrose Light and finally to New York Harbor. The first three days of the voyage from Queenstown passed without incident. From 11 April to local apparent noon the next day, Titanic covered 484 nautical miles (557 mi; 896 km); the following day, 519 nautical miles (597 mi; 961 km); and by noon on the final day of her voyage, 546 nautical miles (628 mi; 1,011 km). From then until the time of her sinking she travelled another 258 nautical miles (297 mi; 478 km), averaging about 21 knots (24 mph; 39 km/h). 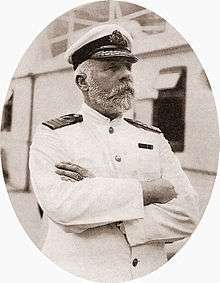 At 11:40 p.m. (ship's time) on 14 April, lookout Frederick Fleet spotted an iceberg immediately ahead of Titanic and alerted the bridge. First Officer William Murdoch ordered the ship to be steered around the obstacle and the engines to be put in reverse, but it was too late; the starboard side of Titanic struck the iceberg, creating a series of holes below the waterline. [lower-alpha 11] Five of the ship's watertight compartments were breached. It soon became clear that the ship was doomed, as she could not survive more than four compartments' being flooded. 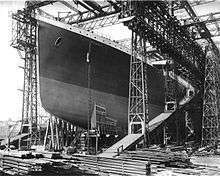 Titanic began sinking bow-first, with water spilling from compartment to compartment as her angle in the water became steeper. At 2:20 a.m., two hours and 40 minutes after Titanic struck the iceberg, her rate of sinking suddenly increased as her forward deck dipped underwater, and the sea poured in through open hatches and grates. 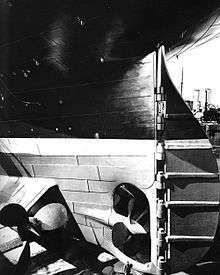 As her unsupported stern rose out of the water, exposing the propellers, the ship began to break in two between the third and fourth funnels, due to the immense strain on the keel. With the bow underwater, and air trapped in the stern, the stern remained afloat and buoyant for a few minutes longer, rising to a nearly vertical angle with hundreds of people still clinging to it, before plunging into the murky depths. For many years it was generally believed the ship sank in one piece; however, when the wreck was located many years later, it was discovered that the ship had fully broken in two. All remaining passengers and crew were immersed into lethally cold water with a temperature of 28 °F (−2 °C). [lower-alpha 13] Almost all of those in the water died of cardiac arrest or other bodily reactions to freezing water, within 15–30 minutes. Only 13 of them were helped into the lifeboats, though these had room for almost 500 more people. Distress signals were sent by wireless, rockets, and lamp, but none of the ships that responded was near enough to reach Titanic before she sank. A radio operator onboard the Birma, for instance, estimated that it would be 6 a.m. before the liner could arrive at the scene. Meanwhile, the SS Californian, which was the last to have been in contact before the collision, saw Titanic's flares but failed to assist. Around 4 a.m., RMS Carpathia arrived on the scene in response to Titanic's earlier distress calls. 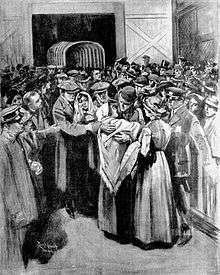 About 710 people survived the disaster and were conveyed by Carpathia to New York, Titanic's original destination, while 1,500 people lost their lives. Carpathia's captain described the place as an ice field that had included 20 large bergs measuring up to 200 feet (61 m) high and numerous smaller bergs, as well as ice floes and debris from Titanic; passengers described being in the middle of a vast white plain of ice, studded with icebergs. 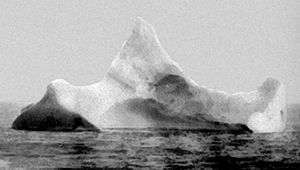 The iceberg thought to have been hit by Titanic, photographed on the morning of 15 April 1912. Carpathia took three days to reach New York after leaving the scene of the disaster. Her journey was slowed by pack ice, fog, thunderstorms and rough seas. She was, however, able to pass news to the outside world by wireless about what had happened. The initial reports were confused, leading the American press to report erroneously on 15 April that Titanic was being towed to port by the SS Virginian. Carpathia was hurriedly restocked with food and provisions before resuming her journey to Fiume, Austria-Hungary. Her crew were given a bonus of a month's wages by Cunard as a reward for their actions, and some of Titanic's passengers joined together to give them an additional bonus of nearly £900 (£80,361 today), divided among the crew members. In January 1912, the hulls and equipment of Titanic and Olympic had been insured through Lloyd's of London. The total coverage was £1,000,000 (£89,289,575 today) per ship. The policy was to be "free from all average" under £150,000, meaning that the insurers would only pay for damage in excess of that sum. The premium, negotiated by brokers Willis Faber & Company (now Willis Group), was 15 s (75 p) per £100, or £7,500 (£669,672 today) for the term of one year. Lloyd's paid the White Star Line the full sum owed to them within 30 days. Many charities were set up to help the victims and their families, many of whom lost their sole breadwinner, or, in the case of many Third Class survivors, everything they owned. On 29 April opera stars Enrico Caruso and Mary Garden and members of the Metropolitan Opera raised $12,000 ($292,682.93 in 2014) in benefits for victims of the disaster by giving special concerts in which versions of "Autumn" and "Nearer My God To Thee" were part of the programme. In Britain, relief funds were organised for the families of Titanic's lost crew members, raising nearly £450,000 (£40,180,309 today). One such fund was still in operation as late as the 1960s. The US Senate's inquiry into the disaster was initiated on 19 April, a day after Carpathia arrived in New York. 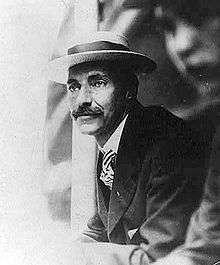 The chairman, Senator William Alden Smith, wanted to gather accounts from passengers and crew while the events were still fresh in their minds. Smith also needed to subpoena all surviving British passengers and crew while they were still on American soil, which prevented them from returning to the UK before the American inquiry was completed on 25 May. The British press condemned Smith as an opportunist, insensitively forcing an inquiry as a means of gaining political prestige and seizing "his moment to stand on the world stage". Smith, however, already had a reputation as a campaigner for safety on US railroads, and wanted to investigate any possible malpractices by railroad tycoon J. P. Morgan, Titanic's ultimate owner. The British Board of Trade's inquiry into the disaster was headed by Lord Mersey, and took place between 2 May and 3 July. Being run by the Board of Trade who had previously approved the ship, it was seen by some as having little interest in its own or White Star's conduct being found negligent. Each inquiry took testimony from both passengers and crew of Titanic, crew members of Leyland Line's Californian, Captain Arthur Rostron of Carpathia and other experts. The British inquiry also took far greater expert testimony, making it the longest and most detailed court of inquiry in British history up to that time. The two inquiries reached broadly similar conclusions; the regulations on the number of lifeboats that ships had to carry were out of date and inadequate, Captain Smith had failed to take proper heed of ice warnings, the lifeboats had not been properly filled or crewed, and the collision was the direct result of steaming into a dangerous area at too high a speed. Neither inquiry's findings listed negligence by IMM or the White Star Line as a factor. The American inquiry concluded that since those involved had followed standard practice the disaster was an act of God. The British inquiry concluded that Smith had followed long-standing practice that had not previously been shown to be unsafe, noting that British ships alone had carried 3.5 million passengers over the previous decade with the loss of just 10 lives, and concluded that Smith had done "only that which other skilled men would have done in the same position". The British inquiry also warned that "what was a mistake in the case of the Titanic would without doubt be negligence in any similar case in the future". One of the most controversial issues examined by the inquiries was the role played by SS Californian, which had been only a few miles from Titanic but had not picked up her distress calls or responded to her signal rockets. Californian had warned Titanic by radio of the pack ice that was the reason Californian had stopped for the night, but was rebuked by Titanic's senior wireless operator, Jack Phillips. Testimony before the British inquiry revealed that at 10:10 p.m., Californian observed the lights of a ship to the south; it was later agreed between Captain Stanley Lord and Third Officer C.V. Groves (who had relieved Lord of duty at 11:10 p.m.) that this was a passenger liner. At 11:50 p.m., the officer had watched that ship's lights flash out, as if she had shut down or turned sharply, and that the port light was now visible. Morse light signals to the ship, upon Lord's order, were made between 11:30 p.m. and 1:00 a.m., but were not acknowledged. If Titanic were as far from the Californian as Lord claimed, then he knew, or should have known, that Morse signals would not be visible. A reasonable and prudent course of action would have been to awaken the wireless operator and to instruct him to attempt to contact Titanic by that method. 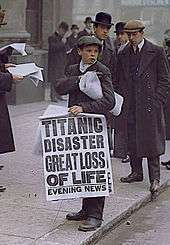 Had Lord done so, it is possible that he could have reached Titanic in time to save additional lives. The number of casualties of the sinking is unclear, due to a number of factors. These include confusion over the passenger list, which included some names of people who cancelled their trip at the last minute, and the fact that several passengers travelled under aliases for various reasons and were therefore double-counted on the casualty lists. The death toll has been put at between 1,490 and 1,635 people. The tables below use figures from the British Board of Trade report on the disaster. 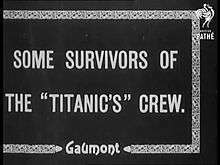 Fewer than a third of those aboard Titanic survived the disaster. Some survivors died shortly afterwards; injuries and the effects of exposure caused the deaths of several of those brought aboard Carpathia. The figures show stark differences in the survival rates of the different classes aboard Titanic. Although only 3% of first-class women were lost, 54% of those in third class died. 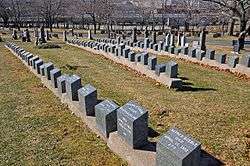 Similarly, five of six first-class and all second-class children survived, but 52 of the 79 in third class perished. The differences by gender were even bigger: nearly all female crew members, first and second class passengers were saved. Men from the First Class died at a higher rate than women from the Third Class. The last living survivor, Millvina Dean from England, who at only nine weeks old was the youngest passenger on board, died aged 97 on 31 May 2009. A special survivor was crew member Violet Jessop who survived the sinkings of both Titanic and Britannic and was aboard Olympic when she was rammed in 1911. 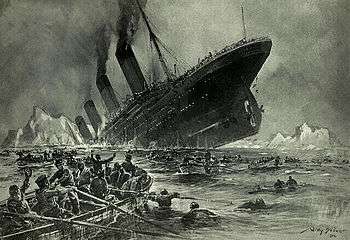 Only 333 bodies of Titanic victims were recovered, one in five of the over 1500 victims. Some bodies sank with the ship while currents quickly dispersed bodies and wreckage across hundreds of miles making them difficult to recover. By June one of the last search ships reported that life jackets supporting bodies were coming apart and releasing bodies to sink. 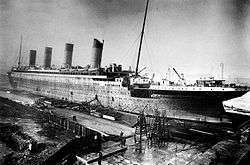 Titanic was long thought to have sunk in one piece and, over the years, many schemes were put forward for raising the wreck. None came to fruition. The fundamental problem was the sheer difficulty of finding and reaching a wreck that lies over 12,000 feet (3,700 m) below the surface, in a location where the water pressure is over 6,500 pounds per square inch. 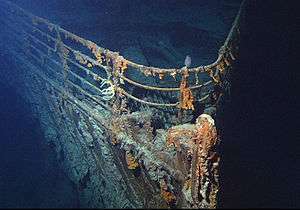 A number of expeditions were mounted to find Titanic but it was not until 1 September 1985 that a Franco-American expedition led by Robert Ballard succeeded. The team discovered that Titanic had in fact split apart, probably near or at the surface, before sinking to the seabed. The separated bow and stern sections lie about a third of a mile (0.6 km) apart in a canyon on the continental shelf off the coast of Newfoundland. They are located 13.2 miles (21.2 km) from the inaccurate coordinates given by Titanic's radio operators on the night of her sinking, and approximately 715 miles (1,151 km) from Halifax and 1,250 miles (2,012 km) from New York. Since its initial discovery, the wreck of Titanic has been revisited on numerous occasions by explorers, scientists, filmmakers, tourists and salvagers, who have recovered thousands of items from the debris field for conservation and public display. The ship's condition has deteriorated significantly over the years, particularly from accidental damage by submersibles but mostly because of an accelerating rate of growth of iron-eating bacteria on the hull. It has been estimated that within the next 50 years the hull and structure of Titanic will eventually collapse entirely, leaving only the more durable interior fittings of the ship intermingled with a pile of rust on the sea floor. Titanic has gone down in history as the ship that was called unsinkable. [lower-alpha 20] For more than 100 years, she has been the inspiration of fiction and non-fiction. She is commemorated by monuments for the dead and by museums exhibiting artefacts from the wreck. Just after the sinking memorial postcards sold in huge numbers together with memorabilia ranging from tin candy boxes to plates, whiskey jiggers, and even black mourning teddy bears. Several survivors wrote books about their experiences but it was not until 1955 the first historically accurate book A Night to Remember was published. The Titanic disaster was commemorated through a variety of memorials and monuments to the victims, erected in several English-speaking countries and in particular in cities that had suffered notable losses. These included Southampton, Liverpool and Belfast in the United Kingdom; New York and Washington, D.C. in the United States; and Cobh (formerly Queenstown) in Ireland. A number of museums around the world have displays on Titanic. 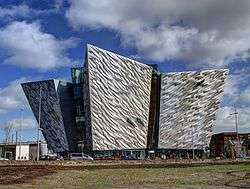 In Northern Ireland, the ship is commemorated by the Titanic Belfast visitor attraction, opened on 31 March 2012, that stands on the site of the shipyard where Titanic was built. In a frequently commented-on literary coincidence, Morgan Robertson authored a novel called Futility in 1898 about a fictional British passenger liner with the plot bearing a number of similarities to the Titanic disaster. 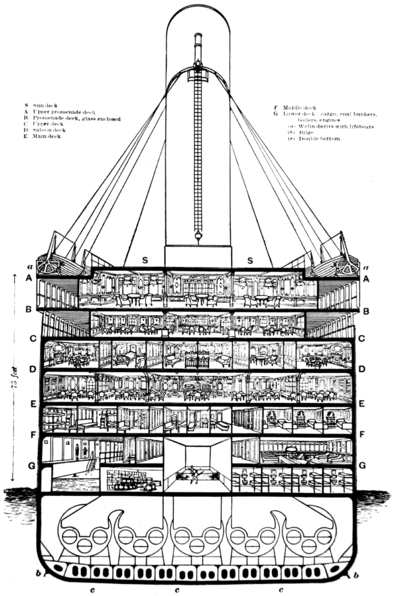 In the novel the ship is the SS Titan, a four-stacked liner, the largest in the world and considered unsinkable. But like the Titanic, she sinks on her maiden voyage after hitting an iceberg and does not have enough lifeboats. 19 April – 25 May: US inquiry. There have been several proposals and studies for a project to build a replica ship based on the Titanic. A project by South African businessman Sarel Gaus was abandoned in 2006, and a project by Australian businessman Clive Palmer was announced in 2012, known as the Titanic II. In late 2014 it was announced that the project has been abandoned due to low funding. A Chinese firm named "Seven Star" commenced a project in January 2014 to build a replica of the Titanic for use as part of a water-front theme park. The ship will take on passengers and then, without actually leaving port, it will simulate being struck by an iceberg and sinking. The project has been criticised as being in "poor taste". Audio tape interview by Lyle Bebensee of the last male survivor of the sinking of the Titanic, Bill Muller. ↑ Thomas Beattie, a first class passenger, and two crew members, a fireman and a seaman. ↑ "Patrick S. Ryan, The ITU and the Internet's Titanic Moment" (PDF). Retrieved 2014-07-04. ↑ "Outgoing Steamships – Sail Saturday October 26, 1912: Majestic (Southampton)". The Sun. October 24, 1912. Retrieved 18 May 2015. ↑ Bruce Beveridge et al., edited by Art Braunschweiger (2008). Titanic : the ship magnificent (3rd ed.). Stroud, Gloucestershire: History Press. ISBN 0752446061. ↑ Wels 1997, p. 34. ↑ "3rd Class General Room". National Museums Northern Ireland. 2011. Retrieved 28 May 2011. ↑ "1st Class Cafe Parisien". National Museums Northern Ireland. 2011. Retrieved 28 May 2011. 1 2 Gill 2010, p. 146. ↑ "Board of Trade's Administration". British Wreck Commissioner's Inquiry. 30 July 1912. Retrieved 9 November 2008. ↑ McCarty & Foecke 2012, p. .
↑ Smith, Jonathan. "Titanic: The Hingley Anchors". 1 2 3 Marriott, Leo (1997). TITANIC. PRC Publishing Ltd. ISBN 1-85648-433-5. ↑ Joseph J. Portanova. "Memory and Monuments: Some Sites Connected with the Titanic in Manhattan" (PDF). New York University. Retrieved 24 Aug 2015. ↑ John Lang (2012). Titanic: A Fresh Look at the Evidence by a Former Chief Inspector of Marine Accidents. Rowman & Littlefield Publishers. p. 124. ISBN 1442218924. ↑ "Titanic and co, RMS Olympic The Old Reliable". Titanicandco.com. Retrieved 2013-05-28. ↑ James Donahue (1911-09-20). "The Titanic's Sister Ship Olympic". Perdurabo10.tripod.com. Retrieved 2013-05-28. ↑ "Hypothermia safety". United States Power Squadrons. January 23, 2007. Retrieved 2008-02-19. ↑ Paul Rogers. "The Titanic and the Indifferent Stranger". Encyclopedia-titanica.org. Retrieved 2013-05-28. ↑ "Titanic and other White Star ships Titanic Crew Member Profile: Violet Constance Jessop, Ship Stewardess". Titanic-whitestarships.com. 1958-07-19. Retrieved 2013-05-28. 1 2 Mowbray, Jay Henry (1912). "Chapter xxi. the funeral ship and its dead". The sinking of the Titanic (1912). Retrieved 24 November 2008. ↑ "Why So Few?". Museum.gov.ns.ca. Archived from the original on 2013-01-25. Retrieved 2013-05-28. ↑ Canfield 8 March 2012. ↑ "Titanic | United Nations Educational, Scientific and Cultural Organization". Unesco.org. Retrieved 2013-10-02. ↑ "Captainsvoyage-forum, lifeboat requirements". Captainsvoyage-forum.com. Retrieved 2013-05-28. ↑ Conlin, Dan (2013-04-15). "A Titanic Report that Changed History". Marinecurator.blogspot.ca. Retrieved 2013-05-28. 1 2 Minichiello,P.E., Ray. "TITANIC Tragedy Spawns Wireless Advancements". The Guglielmo Marconi Foundation, U.S.A., Inc. Retrieved 30 September 2016. ↑ "Navigation Center, Ice Patrol". Navcen.uscg.gov. Retrieved 2013-05-28. ↑ "45p SY Scotia". Mike Skidmore. Retrieved 17 July 2015. ↑ BBC News 31 March 2012. ↑ "Gibraltar Titanic stamps". Gibraltar-stamps.com. Retrieved 2013-05-28. ↑ "Titanic - Futility". Retrieved 15 October 2014. ↑ "Launch of Titanic". National Museums Northern Ireland. 2011. Retrieved 30 May 2011. ↑ "Chinese firm Seven Star to build full-size Titanic replica and sink it - BelfastTelegraph.co.uk". Canfield, Clarke (8 March 2012). "Full Titanic site mapped for 1st time". The Associated Press. Retrieved 9 March 2012. "Report on the Loss of the "Titanic." (s.s.)". British Wreck Commissioner's Inquiry, Final Report (Watertight Compartments). 30 July 1912. Retrieved 14 April 2012.